Posted March 14th, 2012 by Gayatri Bajpai & filed under Film Festival, Pop Culture. I got passes to the short film sections of the Women in Film and Television Festival that hit Vancouver on the 8th of March and wrapped up on the 11th. Read on for reviews of my picks from the Saturday showcase of shorts from the Yukon. A young bespectacled man who grew up spending all his time at a piano has rarely ventured out into the world. In Soft Spoken he takes it upon himself to learn to ride a bicycle. 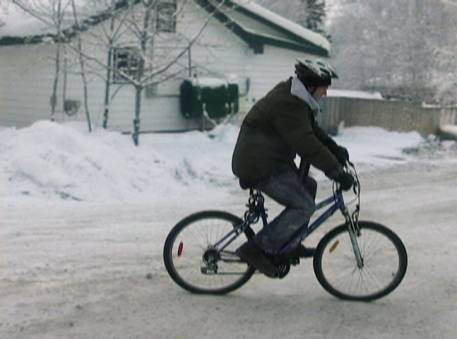 He puts his wheels to the icy roads of Dawson City with a little help from his friend, Logan, and hilarity ensues. Little touches like the fast-forwarded Charlie Chaplinesque antics he unintentionally performs on the bike add to the appeal of this short ‘n’ sweet underdog tale. Afterwards, the protagonist recounts the experience with Logan strumming a guitar in the background to set the mood. Soft Spoken won both the ‘People’s Choice’ and ‘Best Film’ awards at the 48-Hour Film Project contest in 2011, hardly surprising considering its shy guy’s endearing personality. A simple, but well told ‘day-in-the-life’. 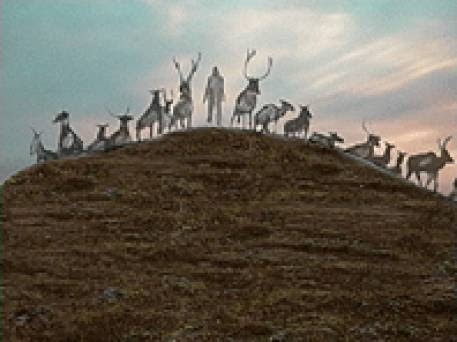 This innovative short combines animation and live footage of caribou grazing in the wilderness to tell the story of how these animals came to fear humans, in the lore of the Sayisi Dene. As told by the director’s father, the story winds its way from the playful meddling of young women who spot and brand caribou, to their subsequent disappearance and rescue by a young man of the same tribe. The semi-transparent human figures drawn on top of the live footage lend the film a mythical quality to match its narrative. The result is magical transportation to another world, and a poetic record and preservation of oral history. 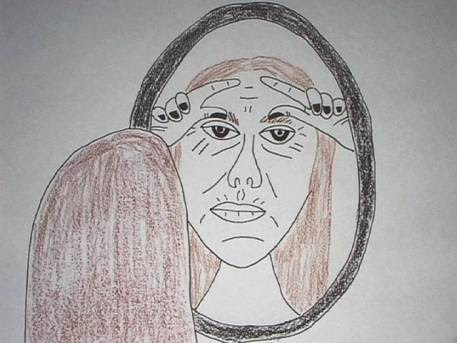 Time Lines is a hand-drawn animation that tells a different story about each of the sets of lines on an old woman’s face. The wrinkles dance around on the page and rearrange into images of defining moments in her life. Graduation. Her parents’ deaths leaving her all alone. The births of her children. By taking the saying about wrinkles and life experience literally, the artist/director tells a poignant tale that left a sizable lump in my throat. Almost as impressive was finding out the sheer industry it required: 2000 pieces of (recycled) paper! Narrated by a young man called Yumi Mercredi, this documentary tells the story of how global warming is affecting the Crow Flats of the Yukon. Yumi’s people, the Vuntut Gwitchin First Nation, make their livelihood off of caribou meat and fishing. But climate change is depleting their natural resources and upsetting caribou migrating patterns. A hard look at the challenges that present themselves one hunting season, Our Changing Homelands is a call to action. It is urgent and heartfelt, from the site of a change that Yumi warns will come to you next. 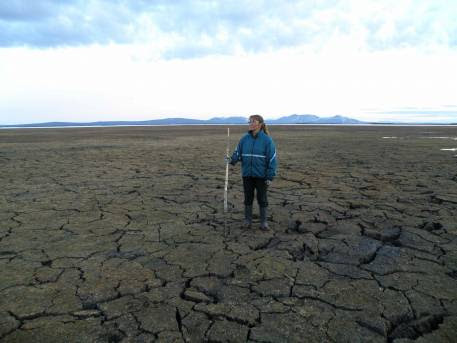 We visit the ‘second-largest wetland’ in all of North America, and see before and after pictures of a 20 km lake that dried up in the span of one day, once an important location for the Mercredis’ caribou hunting. As Yumi’s elders have always emphasized, a connection to the land is of paramount importance to their people. But with a changing land, it is no longer enough. Even the people’s survival skills that have been passed down through the generations have not prepared them for a situation of so little ‘food security’ and a flurry of other problems, though some have turned to agriculture and rearing animals on their own land. The people of Old Crow have a lesson for the world: take only what you need and no more, or else the earth will take something you will miss sorely. Where the urgency of the situation is cause enough to get melodramatic, Our Changing Homelands instead calls your attention to practicalities. And does so without pretense. A refreshing, clear-headed, but beautifully filmed message, and a portrait of a beloved land. 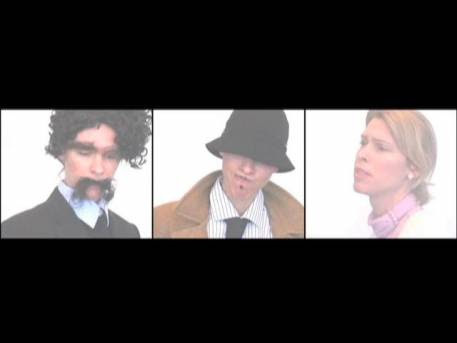 Also made for the Dawson 48 Hour Film Project, The Romance of Helen Trent is a one-woman performance of a dramatic love quadrangle, lip-synced to recordings from the radio show of the same name. Trina Buhler, director and star, performs the roles of two men and two women with pizzazz, twirling her own whiskers, playing coy, and seducing various disguised versions of herself on split screen. She nails the archetypal roles with perfect comedic timing and keeps the audience in giggles.